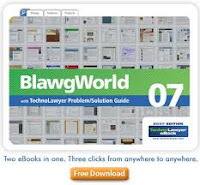 Hat tip to the Of Interest to Lawyers blog which has identified some very pertinent material relating to blogging. Back in 2007, the United States National Judicial College published Case in Point - Are you out there? Whilst it is the Senior Presiding Judge's Guidance which applies to judges and Magistrates in England and Wales, the National Judicial College article put forward some helpful suggestions which might usefully have appeared in the Senior Presiding Judge's Guidance - here. Update 2: Please read The IT Countrey Justice - Social media and the Judiciary and Meeja Law - Should judges blog? A little more detail on the new guidance.and yet more at The Virtual Lawyer (Steve Cornforth blog). DO provide links to other sites and to raw materials so people can find information more easily. DO treat blogs the same as any other mode of communication, adhering to the canons of ethics. DO blog on judicial issues to provide information other judges may need. DO provide helpful tips on challenges such as caseload management. DO write about judicial issues that might give citizens a better understanding of the court system. DON’T write blog posts about pending cases. DON’T mix your personal and your professional life into one blog. DON’T write anything that could compromise your safety or the safety of those in the courthouse. DON’T blog on issues that could increase the number of cases from which you could be recused. “As long as judges are using blogs to enhance public education and understanding of our justice system and not compromising the integrity of cases, then judicial blogs could serve and promote a greater understanding of the challenges and difficulties judges face in advancing justice” ~ Hon. William F. Dressel, President of The National Judicial College. To the list above might be added the need for the writer to seek balance in any blogposts. No matter what the subject, there are always arguments one way or the other but impartiality could be compromised if the writer comes clearly down in favour of one argument. Give the "pros" and the "cons" together with relevant links and references. A further point may be that the blog owner should consider retaining control over the publication of comments. It is worthy of note that The Honourable Michael Kirby - Judge of the High Court of Australia from 1996 to 2009 - maintains an interesting blog. However, I am not sure whether he did so whilst actually serving as a judge. (Editorial note: I have since discovered that he did not). The apparent "clamp down" on blogging comes at a time when the courts themselves have opened up by permitting (within certain limits) "tweeting" from the court room - post of 14th December 2011. "I think that a more active approach might usefully be taken by those of us who are concerned with the administration of justice to ensure that judgments are publicised and properly reported. We should perhaps build on the Supreme Court’s practice of issuing short, easily accessible judgment summaries with judgments; we should foster the already developing community of active informed court reporting on the internet through blogs, and tweeting; we should support the responsible legal journalists; we should initiate, support, encourage and assist public legal education. The great strength of our society is that it is built on the competing voices of free speech. Justice to be truly open must join its voice to the chorus; and must ensure that inaccurate or misleading reporting cannot gain traction." The Law Society issued its guidance on Social Media in December 2011.